I grew up drinking a ginormous glass of milk everyday. My family always bought skim milk and I loved it! It was refreshing, filling and a quick and easy snack for me to “make” all by myself. One day, I was eating Flintstone vitamins (you know, the nasty, chalky ones) and I started to wash them down with a huge gulp of milk when I realized that the milk had turned sour. My dad who was watching me knew that I hated Flintstone vitamins and he thought the face I was making from the sour milk was really just because I hated the taste of the vitamins. So…he made me swallow it. Curdled, sour milk. Yuck! For a while after that, I didn’t really care to drink milk. I actually can’t even remember the last time I had skim milk. I’m guessing it was a couple of years ago. I don’t miss it at all though! There are so many kinds of non-dairy milk that it can even be overwhelming. Brett loves almond milk and drank it on his own before we even got married. I love almond milk too, but lately I’ve been making my own milk at home more than buying it at the store. I love having a fresh batch of milk to enjoy, knowing that it’s free of weird additives and thickeners. While I love making my own, non-dairy milk, I will say that making Homemade Almond Milk isn’t always cheap. If you have access to a store that sells nuts in bulk and if you turn your almond pulp into almond flour, then you might find that Homemade Almond Milk is economical and worth your time. Unfortunately, that’s another thing that might keep someone from making almond milk at home: time. In order to make almond milk, you have to soak your almonds for at least a few hours or overnight. For most people that’s just simply too much planning. 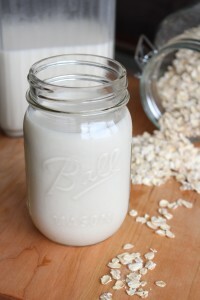 And while I absolutely love almond milk, I’ve gotta say that I’ve fallen hard for Homemade Oat Milk! It’s super cheap to make and doesn’t require soaking the oats. 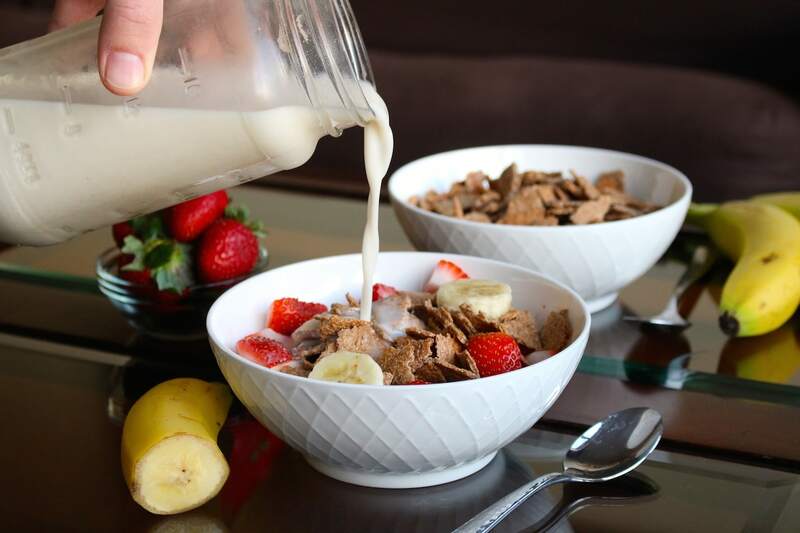 So in less than 5 minutes you can have your own, non-dairy milk that’s cheap and delicious! This Homemade Oat Milk is so thick and creamy too. I’ve been drinking it daily since I discovered how easy it is to make. For the first time in a long time, I’ve been able to enjoy a plain ol’ glass of milk. Yay for Homemade Oat Milk! Can you heat homemade oat milk for lattes? One downside to homemade oat milk (at least that I’ve found) is that it has the tendency to thicken up when you heat it. Even though you can strain the oat milk to remove the excess oat pulp, there are still super-fine oat particles in the oat milk. Heating the milk causes the those fine particles in the milk to thicken, kind of like if you were cooking oatmeal on the stove. For this reason, I usually use homemade oat milk for things like cereal, smoothies, iced drinks etc. However, I have found that the heat from baking doesn’t affect it. I don’t know how many times I’ve begun baking something only to realized that I don’t have enough non-dairy milk to complete the recipe. That’s when I quickly whiz up some oat milk! Can I put Oat milk in my tea or coffee? While I don’t think homemade oat milk is great heated in large quantities (remember the oatmeal reference?? ), I have had readers comment that it works great in small quantities in their coffee or tea. Instead of heating it, just add a splash to your hot coffee or tea and enjoy! Have you heard of Oatly yet? If you haven’t, you NEED to find a carton, specifically the Barista Edition. Like I said above, homemade oat milk doesn’t heat up very well for lattes, but thankfully Oatly does! The barista edition is especially delicious warmed up for homemade tea or coffee lattes. Oftentimes, its the oat milk used in cafes for a delicious non-dairy latte. When I have access to Oatly, I love to have it on hand for hot drinks. Additionally, I’ll a batch of my homemade oat milk on hand as a cheaper alternative for when I’m making smoothies, having some cereal or baking! Homemade oat milk is already really inexpensive, but you can make even more bang for your buck by saving the oat pulp and using it in other recipes. I haven’t experimented a ton with oat pulp, but you can always cook it similarly to oatmeal or add it to smoothies for some added whole grains and fiber. You can even make Chocolate Chip Oatmeal Pulp Cookies! While I love homemade oat milk for the flavor and price, I still do love so many other kinds of homemade non-dairy milks. I’m often switching up what kind we have on hand! I have a ton of recipes on my blog for different kinds of non-dairy milk, so if you’re looking to start making your own homemade non-dairy milk, be sure to check out some of the recipes below! Okay, enough chit chat. Below you’ll find the recipe for homemade oat milk. If you give it a try, I’d love for you to leave a comment down below, rate the recipe and share it with any friends who you think would also enjoy it! Using just oats and water you can make and enjoy this cheap and delicious Homemade Oat Milk! 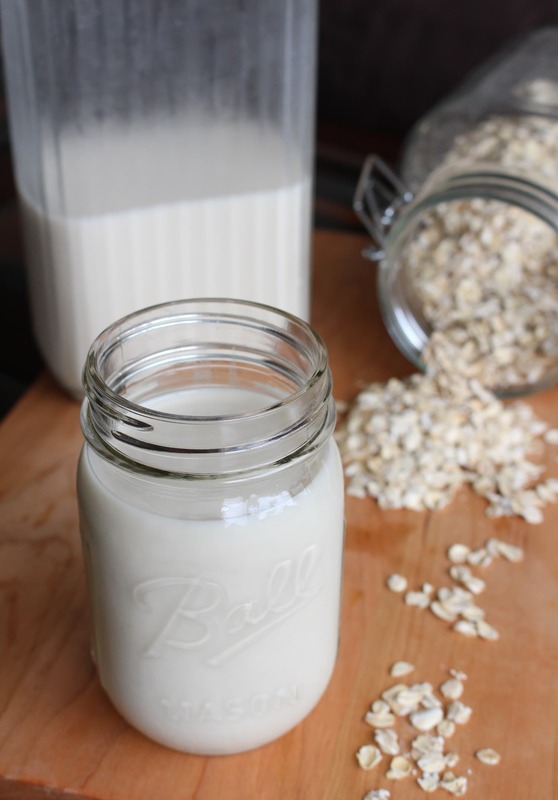 Strain the oat milk by pouring it through a nut milk bag (or cheese cloth) into a pitcher or bowl. Use your hands to squeeze the milk out of your nut milk bag. Once no more milk is coming out, you can discard the oat pulp. Refrigerate your oat milk until chilled. Store your oat milk in the refrigerator for 2-3 days. Shake thoroughly before using. *If you have a high speed blender and want your oat milk to remain thick, you can drink it without straining it. *If you are using a liquid sweetener to sweeten your milk, first make and strain your milk using only the oats and water. After you've strained your milk, then pour the oat milk back into your blender and blend in your liquid sweetener. Don’t forget to comment and rate the recipe! Also, coming soon is a recipe for Homemade Bran Flakes that go perfectly with this Oat Milk! Can you clarify the serving size? On my browser it says serving size: 3. Thank you for the post! Hi Cheryl! Yes three servings is correct. This recipe makes about three cups of oat milk, give or take a little. Hope that helps! What a great recipe! I added a cup and a half of oats and about 24 oz of water, plus two dried plums for sweetness! It turned out great, and I even gave the strained “oatmeal” to my little one for a snack! Bonus!! Oh plums! What a great addition. Thanks for sharing Sarah! Is it necessary to prewash the oats before beginning this process? Thank you for sharing this recipe. I got excited when I saw this on Pinterest. 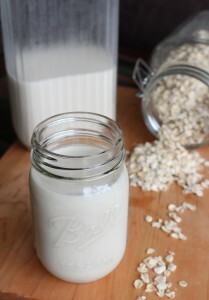 I love making my own nut milks, so seeing your pin made me click through to learn how to make this one. I’m excited to try this soon. Thank you again. You’re very welcome Theresa! I really hope it works out for you! Thanks for the recipe. I think that your version is rather better than shop bought. Try adding a little sunflower oil and some salt. That will counteract the chalkiness. So glad you enjoyed this recipe Peter! And thanks for the tips! Love this! Just mafe some. My partner and I both think it tastes a bit chalky…i did add vanilla and maple syrup. Think maybe we didn’t strain quite enough? But pretty good for my first try! We had the idea because we recently visited a coffee shop where oat milk was the only non-dairy option, and it tasted goid! I will kerp experimenting. I’ve read about some people adding a thickener to rice milk… might be with a try with some xanthan gum or lecithin? This is phenemenol. Love the story leading into the recipe. One of my favorite sweetners is made out of apples called “Dolcedi.” Thought to offer that info. Please, please, use organic oats. Most non-gmo grains (oats, wheat and barley in particular) are sprayed with glyphosate (Roundup) 7-10 days before harvest – to “dessicate” them. Just had this random idea to make a nut/seed/grain milk for ultra-complete vegan protein combo. Thought of, possibly, almond-sunflower-oat milk. My Google search for a recipe is what brought me here. I am soooo gonna try this as soon as I finish commenting. I make my own almond milk and have just gotten used to throwing 1 1/4 cup of almonds into some water as soon as my last bottle of almond milk is down to it’s last cup. Because they have to soak for 8 hrs, I can either do this before bed or before work. Once you get used to it, it’s really nothing…and it takes fewer almonds than you might think. I can get two litres of AM from 1/4 cup of dry almonds. 5 stars for oat milk as a beverage or with cereal! Thank you Faith! He Lekawa! Thanks so much for commenting and sharing! It’s so helpful to hear what others are doing/trying and where they have found success. Yes, this milk isn’t the greatest for cooking, but I have found it’s great for baking…or at least I use it often when in a pinch. I hope you enjoy it with your cereal!! Thanks again! I found that I too couldn’t use the very last part of my homemade oat milk due to this issue, unless I used the whole batch quickly and stirred it often! Would love to hear if anyone else has had any luck in this area! hi, love your post. You might try adding lecithin to thicken it up. Are there any food scientists in the crowd who can tell us what the pulp consists of? I assume that most of the soluble fiber is gone, but what else? I may try drying it out and weighing it to compare it with the weight of the unprocessed oats. I did the experiment, using a cup of dry oats weighing 85g. After straining the milk through a fine mesh strainer, I had 80g of wet pulp. I dehydrated this in a low oven, which left me with 15g of dried pulp. So about 82% of the oats went into the milk. The residue I suspect is mostly insoluble fiber. This is great to know Rob! Thanks so much! I’d love to know the results of your experiment Rob! Just made a small batch of oat milk, but this time I roasted the oats in a dry pan before putting them in the blender with a pinch of salt. Turned out great, with a nutty flavour to it (I am fond of nuts and nutty flavours). Thanks again for the recipe! Love from the Netherlands. That sounds absolutely delicious Lia! I’ll have to try that soon. Thanks so much for sharing! If I double the amount of oats, but keep the water the same, will it create a cream that I can use in my coffee? Hi Edward! Good question. I’ve never tried that before so I can’t say for sure. Let me know if you try it and if it works out for you! Sometimes I’ll keep the oats and make a bowl of oats for breakfast with them. I just add in more milk and heat on the stove. I’m sure you could spread them flat on a baking dish and “dehydrate in the oven” to make granola, but I’ve never tried it. If you have success, let us know! I added the pulp to an oatmeal muffin recipe, which turned out terrific. I also used some of the pulp, mixed with a touch of honey, as a super moisturizing face mask. I blended it in one of those bullet microblenders to make it really smooth and it brushed on like a hundred dollar spa treatment. My skin was gorgeous after, and it calmed my rosacea a bit. Such great ideas for the extra pulp Jenna! Thanks so much for sharing with us what worked for you! If you miss almond milk, why not mix a few handfuls of raw almonds in with the oats before processing? One of my friends uses almond butter in hers. Great idea! Thanks for sharing Marilyn! Thanks for the blog. Quick question: will any form/kind of oats do? I recently bought a bag of instant oats. Any idea if there is any difference between the instant oats versus normal oats? Hi! Both quick and regular oats would work. You just won’t have to blend as long with the instant/quick oats because they’ve already been broken down into smaller pieces. I hope it works out for you! I tried this with a mini seive and it was so hard to strain and turned into a thick pulpy milk. Following another lady she said you can do it this way but I didn’t hav luck. I don’t have any nut milk or cheese bags. I will still drink it just prefer a watery substance. I added more water to it and it helped a lot. Sorry you ran into some troubles Becky! If you want thinner milk, you could try blending for less amount of time so that all of the oats don’t completely dissolve in the water, making them hard to strain. But that may change the texture of the final product! Everyone’s blenders and straining products are different so you may need to make a couple batches to find what works for you! I just made it using a new sock ? Well, I made it with a used sock and it hand a nice nutty flavor. That’s awesome a sock works to strain the milk! Thanks for sharing Robin! Thanks, Robin, your comment made me laugh out loud =:D Nutty flavor… too funny! I sieved mine through my coffee filter sieve. It worked ok. Just has to stir it around a bit. Glad you found a method that works! Thanks for sharing! Omg when you mentioned Flintstone vitamins I could remember the taste! That chalky chalky taste. I’m going to try this recipe. Ah I hated those! I hope you like this recipe Nadine! I just have a question, I hope you guys can help me out. I wonder why Oatly’s plain milk has this sweet taste since the only ingredient they put is 10% oats, water and salt. I’ve been experimenting on my oat milk. Thanks in advance. Hi Rey! That’s a good question. I’m not sure why, but I do find that certain non-dairy milks like cashew and Almond have sweet undertones unlike soy milk made with just soy beans that tastes fairly bean-y. Maybe oats are the same? I hope you have success with all your experiments! I haven’t tried this as a creamer yet! I found it can sometimes separate when placed in hot drinks, but it depends. Let me know if you have any success! I went to a latte art completion at Counter Culture in Oakland last week that used Oatly brand oatmilk. Baristas raved about how great it was to use. I’ve heard it’s an amazing non-dairy milk! Thanks for sharing! I am also trying to make my oat milk mimic the taste and creaminess of Oatly’s. I have tried and failed a few times. Plus I have tried to heat up homemade oat milk to add to my matcha latte but it is not working. I can do so with Oatly and it taste delicious! If anyone can advise it will be so helpful! Oatly uses an enzyming process that breaks down the oat starch, making the end result naturally sweeter. Hello- if you make this how long will it last in the fridge? Thanks! I would guess about 2-3 days! The longer it sits, the more it will start to separate and the oats will sink to the bottom. Hope you like it Michelle! Hi, so if it separates, can I just give it a shake and drink it? It depends on how long it’s been in the fridge! If it’s only been a day or two and still smells good, yes. Separation is normal! I’ve read a recommendation to wash the oatmeal after soaking it for half an hour and then blend it with water. Do u think it will make it suitable to warm it up? Hi Liliya! I actually have still never tried to heat up oat milk so I can’t give you a definite answer. Since oats are fairly cheap I say it’s worth a try! Sorry I’m not much more help. Good luck! That’s great advice Chrissy! Yes, I think double straining the milk using cheese cloth would definitely help remove any of the excess oats in the milk. Thanks Chrissy! Can I use any drinking water or just filtered water? Thanks. Hi Maria! Any drinkable water would work. I hope that helps and that you like this easy milk! Thanx a lot for this post, my 1 year old daughter is highly allergic to dairy, nuts, eggs and soybean, therfore i cant give her any off the shelf milk. However she can eat oats and im planning to try ur recipe asap ! Hey Jumana! I’m so glad you found this recipe and I hope it works well for you and your daughter. That must be so hard to maneuver around so many allergies, but hopefully this oat milk will make things a little bit easier! Oat milk is NOT a suitable replacement for a one year old. I hope you discussed this extremely bad dietary decision with her pediatrician. What would you suggest if the child can’t have dairy or nuts? What vitamins are in oats? Nutritional Profile. Oats are an excellent source of manganese and molybdenum. They are also a very good source of phosphorus as well as a good source of copper, biotin, vitamin B1, magnesium, dietary fiber, chromium, zinc and protein. Just wanted to give a fellow allergy-Mama some love! My adult stepdaughter is highly allergic to about 5 different things, and it can be terrifying. In the two years her dad and I have been together, I’ve sat with her in the ER at least 4x with reactions when she didn’t realize a tortilla had a touch of rice flour in it, or was accidentally exposed to dairy. Thanks for this recipe! It turned out great. Just a heads up to fellow readers, since I saw it mentioned a lot in the comments–I soaked the oats for about 20 minutes before starting the recipe. Per the instructions, I only blended for a few seconds in my Vitamix. I do not have a mesh strainer large enough, so I used a nutmilk bag which worked fine with some squeezing of the bag. The results were very tasty (I added the 2tsp of vanilla, a dash of salt, and cinammon) and I do NOT experience any thickening when added to my very hot coffee, likely because of the soaking and quick processing time. The flavor goes quite nicely with coffee and I am so happy to find this recipe. I just made a gallon of fresh, tasty raw oatmilk for $2 and have the strained oats in the fridge to make porridge or add to muffins later. A kitchen (and budget) breakthrough! This is great news Tameka! Thanks so much for sharing your tips and tricks as well! I will try your tips first, I was looking for something to put in my coffee. Thanks. Can I make the oat milk using oat flour? If yes, then how? Hi Donna! I’ve never tried that before. You could definitely give it a try. You just might get thicker milk because you won’t be able to strain out as much of the oats since they’ll already be so fine. You could try blending for a lot less time or just blend extra well and then not strain the milk and leave it thick. Sorry I can’t speak from experience but let me know if it works for you! If I want the Oat milk to be a liiittle bit more “thick” or have less of a watery feel in the mouth, can I add more oats and less water? Hi Celia! Yes. You could try that. Or you could not blend it as long so that it’s thicker. Some people like it even without straining it, but that’s definitely more of a thick, oat milk. I hope you find a ratio that works for you! I did this today from your recipe. It really looks like milk but the taste was horrible. I think the problem was the dish cloth I used to squeeze the milk. The milk had literally some washing product taste… But I want to try once again. It is really simple to prepare as you said. I’m sorry the dish cloth made the taste so bad for you Dana! I hope you can try again and that it works better for you the second time. Hey Faith! I’m looking for a way to avoid bankrupting myself on Oatly milk but I don’t have a normal blender, just a soup stick/wand style immersion one. Do you think it’ll work for this? I think that would work fine! You’ll just learn as you go how long to blend etc to get the consistency you want. Let me know how it turns out! I was looking for an oatmeal cookie recipe and “just happened” to come upon your site! Since I am allergic to cow’s milk, this would be a real blessing for me! Thanks to all the posts, as I did add sweetener, vanilla, and cinnamon. This one is a real KEEPER! This is music to my ears Carmen! So glad you found my post and that you loved the oat milk! So glad you took the chance and found success. And the addition of stevia sounds amazing! Thanks Holly! Hello :-)The old fashioned oats come in fast and regular here.Which one do I use?Does it matter? Quick and old fashioned should both work! Hi! Can I freeze it? Hi Irina. I’ve never tried freezing oat milk, but I’ve found that when I freeze other non-dairy milk it separates in the freezer. But you could still try it since it’s pretty inexpensive. Let me know if you try it and if it works for you! Any update? Did it work freezing it? Thanks for sharing your process for oat milk. Just curious why you would discard the oats. Seems a good blog post topic might be ways to use the oats instead of discarding. The first thought is to add them to baked goods, such as bread or cookies, but I am sure there must be other uses, if one cared to research it. I would just discourage wasting food. Hi! Thanks for commenting. You definitely don’t have to discard the oats and it would be great to use them in other baked goods or meals. I’d love to know what you put the extra oats into! I made mention about this on one of my comments in Oct. 2016. I actually take the pulp, put it into a pot with (1) cup of water. I add (1) tbs. of brown sugar. Some fruit like, cranberries or pineapple. Now you have a nice bowl of oartmeal for breakfast. I also add it to my homemade muffin mixture, bread and homemade soup. Sorry for the typo in oatmeal. That sounds amazing Chris, especially with the brown sugar! Thanks for sharing your tips and tricks. I was going to say – throw it away! That stuff goes straight into porridge or smoothies! Yes, great idea. Thanks Hazel! I practice vermiculture composting and never have to worry about “wasted” food because they eat nearly all my vegan leftovers. And they make my garden grow! That has nothing to do with oat milk lol but it IS conscientious! Hi Faith I made this and I love it. I’ll modify it a bit and I’ll post it on my blog with a link back to yours. Thank you for sharing. Yay! That’s great to hear Jem. 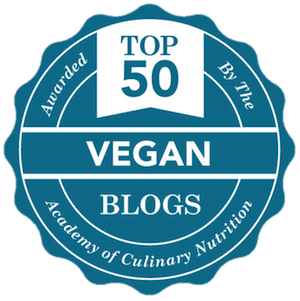 Thanks so much for sharing and linking back to my blog! I used this oat milk as a base for a vegan mac & cheese sauce. It was super thick, but I reserved some of the cooking water from the pasta and used that to thin to my desired consistency. The mac and cheese recipe I used came from the Happy Herbivore cookbook, and called for corn starch to thicken the sauce, which I omitted. Worked pretty well for a first try. I’ll definitely do it again! Ah great advice Suzanne! I love how versatile oat milk is. Thanks for sharing! Hi. I’ve been buying a product called Oatley for the last few years, three or four cartons a week which I realised added up to around £200 a year. 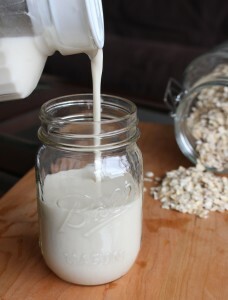 I grow oats and felt a bit of a dunce when I saw how easy it is to make my own oat ‘milk’! For the cost of a blender £25, I’m quid’s in as they say. I’m using whole oats which I soak for half an hour or so, if nothing else it makes them just that bit cleaner. I use it on my ‘crunchy nut’ cornflakes and actually feel that I’m getting a lot more nourishment from my breakfast than with Oatley of which actually only 10% is derived from oats/water. This is awesome Peter! I’m so glad you found a way to save money and even get some more nutrients in your food! Thanks so much for sharing! Thanks for posting! I have some oat groats I want to use and was wondering if they would act the same in this recipe. That’s a good question Elise! I’ve never tried before so I can’t say for sure. Since oat groats are tougher than oats you would probably need a high speed blender or to soak them for a while. I say go for it! Let me know if it works for you! Thanks, will give this a try. I need for use on cereal, including, that’s right, oatmeal. Currently using flax milk, but the diet calls for ‘no oil’ at all (Dr. Caldwell Esselstyn). My heart program requires that strictness to work, so oat milk would seem ideal, even better than nut or seed milks of all kinds. Thanks a lot, Faith. Great Robert! I’ve been making it more often recently and love it. It’s great for baking or cereal. I hope it works for you! Can you use this kind of oat milk in tea or coffee, or does it go gloopy in the hot liquid? Oat milk from a supermarket is ok, but I’d like to make my own if I can use it the same way. Can’t wait ti try though! That’s a good questions Janet! I’m actually not sure, but I think it’d be okay. If you try it out let me know how it works for you! I used a similar recipe which says to rinse and drain the oats first and find it fine in coffee, but maybe a bit oaty in tea. I only use a pinch of coarse salt while blending in my Nutribullet (a lot quicker and easier than a regular blender), no added sugars or vanilla. Make sure you give the storage tub a good shake before pouring or it won’t colour up like milk would. You might find if you take a while to drink a cup of coffee that there is a small amount of “gloop” in the bottom, but I find that with shop bought too. Anyone know of a healthy natural way of stabilising it a bit (ie not Carageenan etc)? Thanks for your comment and for sharing your experiences! This is really helpful. 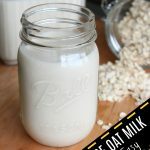 I don’t think Oat Milk is for everyone, but I find it works great in baking and certain drinks and is so cheap to make. I do wish I could find a way to stabilize it though. Keep me posted if you find something that works! I wonder if a bit of agar agar (or gelatin if not vegan) or xanthum gum would work. I just made oatmilk with my blender, left it on till it all turned to milk, no pulp. I added a small handful of raisins, vanilla and I tried it in my coffee. The flavor is a little weird. I’m going to experiment with some flavorings. Hmmmm.. . i’m going to try adding a little cinnamon. I tried the Cinnamon and it worked! Yes! No more expensive almond milk! Yay! I’m glad you discovered that the cinnamon made the oat milk work for you. The addition of the raisins and vanilla sounds amazing too. Thanks so much for sharing! Yes exactly. The texture isn’t great for everything, but it works great in baking and cereal etc.! I used your recipe for this oat milk and loved it. However, I strained it as recommended and did not let it heat up at all in my Vitamix, but it still got gelatinous over night in the fridge. It was quite goopy. Any suggestions to remedy this problem? Hi! I’m glad you loved it and sorry that it got goopy. First, I would recommend, if you’re using a vitamix, to just briefly blend the oats. Basically turn it up to high then turn it off. It allows a creamy milk to form but doesn’t leave the milk super thick after you drain it. That’s probably my best suggestion or try to stir it before you use it or use it right away for baking/cereal etc. and just make small batches at a time. I hope this helps! I feel ya Phil. Now that I have a Vitamix, I blend it for a really short amount of time and it works a lot better. I’ve never used maltose though so I can’t give any advice! I hope you can find something that works! I don’t know if this will make a difference for you, but have you tried soaking & rinsing your oats before just throwing them in the blender? I’ve always soaked my oats beforehand. I’ve never soaked them for oat milk, but I’ve soak them for eating before. Thanks for the tip! I was wondering if I can use the to make vegan chocolate cream pie? I know above it says you can not cook it unless I want a gelatinous mess…well, I kind of want a nice smooth gelatinous mess lol. Any advice would be helpful! Thanks in advance. Hey Lindsay! I don’t know everything that goes into a vegan chocolate cream pie, so I really don’t know whether it’d work or not! If the recipe calls for a non-dairy milk and you want it to thicken anyways, then I say go for it, but I think I’d have to see the recipe. I wish I could help more! I’m going to go for it. Basically vegan chocolate pudding goes into the filling. I’ll let you know how it turns out. Thanks so much for responding so fast! Fun! Yes, please let me know how it goes! I want to make it if it works out! Am I able to give this to a baby? I am slowly about to finish breastfeeding and I want to give her an alternative to cow’s milk. I also hard I can do this with quinoa. Hi Mary! I’m not a doctor so definitely ask your doctor before listening to me, but I don’t see why you couldn’t give this to a baby. I’ve heard about making quinoa milk too but I’ve never tried it! When in doubt I just google things. Sorry I’m not much help. Good luck with everything and thanks for your comment! You can certainly give this to a baby. It can be given as a complementary food, but it should NEVER replace breast milk or formula in the diet for a baby under 1 year old, and should probably not replace breast milk, cow’s milk or formula in the diet for a child under 2-3 years. Commercial non-dairy milks are usually fortified with some of the vitamins and minerals you expect to find in milk, and so are acceptable from 1 year of age, but homemade non-dairy milks are not, so they won’t supply growing children with appropriate doses of calcium or vitamin D. You don’t say how old your child is. Some people wean their babies from the breast at 4 months and others at 4 years. This makes all the difference in what milks we can give them. Babies under a year must have formula or breast milk as the major component of their diets. If you want to follow a vegan diet, soy infant formulas are available. They are necessary until 12 months, but also nutritious for toddlers if they like the taste. Hi! Oat slime is definitely a think, but I usually only noticed it when straining my oat milk in a nut milk bag with my hands. Other than than, I just don’t heat this homemade oat milk or else it get’s thick and gloopy! It’s great for baking, pouring over cereal or in smoothies! I love homemadey Oat Milk! So I’m going to try your recipe next! ‘Cause when I use it to make my hot chocolate with, I get goop, and now I now why! Oh well, I’ll have to use it for only cold mil recipes. Oh great, I hope it works out for you Janice! And so funny how you found my recipe. I definitely remember the first time I tried to make hot chocolate with homemade oat milk…it turned out more like pudding! Thank you so much for this! Cheaper, and dare I say, better than the supermarket alternatives. Ah so happy to hear that Rani! Thanks so much for sharing! Ah, this is music to my ears Sayema!! So glad you like it and that you have so many awesome ideas for the pulp. Love how resourceful you are! Thanks so much for sharing! I just made this at lunch time. It tastes great. My daughter loved it and so did my thirteen year old son. Really creamy. I have always made almond milk, but this beats it no problem. Cheaper too. After I strained the milk, I took the pulp and put it into a pot, I then added one cup of water and some dried cranberries. Cooked it for about five minutes on medium heat. Thickened up real nice and was so tasty. Mmmmmm. Hey Chris! That’s great news! I’m so glad you liked it, and your daughter too. Also, I’m definitely going to do the same thing you did with the pulp. Brilliant! Thanks Faith for the recipe. I would never have thought of Oatmeal milk. Tastes so rich and creamy too. Considering that I always have oatmeal for breakfast anyway. This morning I did the same thing. This time, though, I added some diced apple. Maybe tomorrow I’ll add some pineapple, with a wee bit of the pineapple juice in place of half the water. Now, instead of just having oatmeal for breakfast, I now have an oatmeal drink for during the day. It’s great on such a snowy day here in Edmonton. All it costs me extra is, 3-cups of water, vanilla, salt and a wee drop of cinnamon. Wonderful! Sorry, I forgot to mention. In the past, when I’ve made bread, from time to time I’ve added a cup of oatmeal to the flour, just to get the kids to eat oatmeal. I was thinking when making bread with the pulp left over from the milk. You could always add the pulp to the liquid part of your recipe. You know, with the water and yeast. Mix it around real good before you add it to the flour.No wastage. Such a great idea Chris! I love oatmeal bread too. Adding the pulp would probably produce such an amazing texture and oat-y flavor! Let me know if you try it out and if it works for you! Yum! All those combination sound amazing and you’re exactly right. It’s getting chillier and chillier so it’s always nice to have a creamy drink or warm oats to eat! This really is a great, quick, cheap and simple recipe, turned out delicious! Especially good for overnight oats and smoothies. Thank you! After some trial and error, I find the best combination that works for our family is to add a pinch of salt, use maple syrup instead of dates and also add a tablespoon of sunflower seed oil – the oil really enhances the taste. Hi Mateja! Ah, that’s great news! I’m so glad you like this recipe and have found was to make it more your own and that works for your family. Thanks for letting me know!! Thanks so much for this recipe. I just made it and love it. I love the taste of oats, so that is not a problem for me. I would add a pinch of salt to enhance the taste. Next time I will do that. Ah, so good to hear! Thanks so much for taking the time to comment and let me know! Great idea on the salt! Hi, Faith, thanks for the recipe and the whole idea. We use this primarily in smoothies we make with kale, bananas, watermelon, and numerous other greens. It forms the liquid base of the drink. We had used the pricey boxed almond and oat milk previously and had to find a cheaper alternative. But because it is all from scratch, your milk is of course so much better for us, too. We don’t strain it, for like you said, the Vitamix really leaves almost nothing to strain. It would not matter in such a smoothie, anyway, and oat fiber is so great for you. Thanks again. Have you published your version of bran flakes yet? I’m so glad you’re enjoying this recipe/concept Steve! I got a soy milk maker recently so haven’t been using it as much, but it really is such a cheap and easy way to get milk in a pinch! Thanks for sharing your success! And I do have my bran flakes recipe up on the blog. Just search “bran flakes” and you’ll be sure to find it! Others that have made them have really like them so I hope you can try them out as well! Thanks again for commenting! I’ve been drinking oat milk on my home made granola for years and love it! But I’ve always made it with steel cut oats that have been soaked overnight. I stumbled in here because I want to use the milk to make yogurt but your “don’t heat” warnings have me worried. Do you think using steel oats makes a difference? Or should I ditch the yogurt idea all together. Thanks!! Wow!! Amazing!! I wanted mine more creamier so I only used 1 1/2 cup of water (plus I need a bigger blender) and After the blender I used a hand food processor and then I strained it! And then I added the stevia (had only in powder) and mixed it again! Ufff amazing! Thanks for the recipe! Next time I will make a whole batch!! Ah yay Deyra! This is great news! So glad you like it and that you found a ratio that works well for you! Thanks! I think I like this for drinking on its own and cold cereal better than any of the other plant milks. This is going to be *much* nicer than having almond milk in shelf stable cartons in my pantry. Hi Dina! That’s so great to hear! I’m glad you enjoy this Oat Milk. Thanks for sharing! Hi, I LOVE this recipe! I have made it many times. I’m a blogging newbie and thought I’d let you know I linked to your recipe 🙂 It really helped me to cut out dairy at the start as non-dairy milks were not very cheap here. Didn’t know you could make milk from oats before I saw this. Thanks! Sarah that’s awesome!! So glad it helped and glad you’re spreading the word! Why cannot it be heated up? Does it transform into a kind of smooth porridge? Oat milk is so great isn’t it?! And yes, when you hear it up it gets thick and goopy…not a pretty site! JUST made this! I have never tried Oat Milk in my life and have always wanted to make it, now, I finally did it 🙂 Thanks so much for your recipe! It is currently chilling in the fridge, cant wait to have a glass! SO MUCH cheaper than anything else! I do however prefer Almond Milk, but this is a nice add! Awesome Ashley!! I hope t works for you! I too love almond milk, but this is such a good, cheap alternative! Why not add oat milk to the almond milk a little at a time and add more each time you make it? You’ll slowly end up all oat milk. In the meantime, you’re cutting the cost of your almond milk and developing a taste for all oat milk. That’s what I’m going to do with cow’s milk to quit drinking it. I tried almond milk and soy milk and both seems to have sweet undertones and vanilla. I don’t like them. I want something that tastes like real milk. I’m going to slowly add oat milk (with salt, no sweetener nor vanilla) to cow’s milk to quit drinking cow’s milk. Because of trying to go vegan or vegetarian–whichever it is that still uses eggs and milk–I quit meat, poultry, and fish but, haven’t been 100% successful YET. I occasionally buy milk or eggs but, would like to quit milk totally, too. The oat milk reduction should help me with that. (I used that method when I quit sugar for sweetener in my gallon of tea, then reversed that when the horror stories came out about sweeteners). The slow exchange of one for the other works great for me. Anyway, that’s what I’m going to try. Maybe it will help others, too. Yummm!!! I just made oat milk earlier today! So creamy and delicious and a nice change up from almond milk. I add a bit of cinnamon to mine and it’s quite nice! Cinnamon is a great idea Laura! Thanks for sharing! Do you strain your oat milk? The photo looks so creamy, I would like to prepare it the way you do. Yes! But I’ve heard that you can enjoy it unstrained as well. It kind of depends on the power of your blender and how you like your milk. My vitamix blends it up pretty well so that there isn’t much to strain. My old blender though definitely let me get a lot of pulp out to make is smoother. I hope that help! You can always try both ways and see what you like since it’s so cheap to make! Delicious! I tried your recipe last week. It turned out great. I use it to make my oatmeal in the morning. It tastes so good with that bit of vanilla. I’m making it again today, but with honey instead of the dates this time. Thanks! That’s awesome Nancy! Thanks for sharing!! Hey, I’ve been trying all sorts of non-dairy milks and this looks great! Does it go well with coffee? That’s my main concern… I mean, will it clog or separate or something? Hey Iliana! That’s awesome you’ve been experimenting with non-dairy milks. There are so many variations! I find that oat milk should be heated up, other wise it gets thick, and we don’t want that. I’m not sure what adding it to hot coffee would do, but I think cashew milk or soy milk would be better. 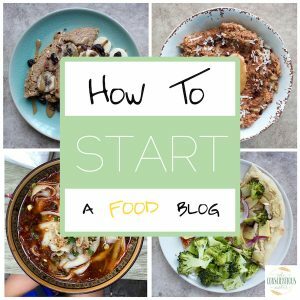 I have recipes for those on my blog so check them out! Good to know! Yeah, adding it to things already warmed up and removed from heat doesn’t seem to thicken it which is great! Thanks Jerica! Beautiful photos indeed! Do you not soak your oats prior to blending? Perhaps this will save me time. In really excited to try this! Is there a specific brand of nut bag you might recommend from Amazon for making this? Also, why do you do with the left over pulp from the blended oats? I’d imagine that, once dry, you might use it as oat flour! Cool Anthony! It’s so easy to make and a really cheap version of non-dairy milk. Just don’t heat it up! It will get gelatinous:) This bag (http://www.amazon.com/gp/aw/d/B00KLT6X9W/ref=pd_aw_sbs_79_1?refRID=1KYRZ0FCX6AYKCJQYGDM) from Amazon has great reviews as do others. I don’t think you can go too wrong! I usually don’t do much with the pulp, but I’m sure you can dehydrate it on the lowest setting in your oven for a few hours and then blend it in a processor to make flour. Or you can add a few tablespoons into your smoothies for extra fiber! This milk is awesome for baking too, especially when you’re in a pinch. Hope it works for you! Can you really use the oatmeal milk to bake with? Does it change the texture of the food in a negative way? I use it all the time to bake Sherri! If I’m in the middle of baking and realize I don’t have milk, I just whip up some oat milk in my blender and use it! I didn’t know that Anne! Thanks for commenting! Looks so creamy and fabulous! Thanks Leigha! Yeah, Brett and I took the plug and got one…so fun! We got a Canon EOS Rebel SL1. It’s super light weight and I’m slooooowly learning how to use it:) Yeah, almond milk is cheaper for me to buy in the store so I’m so glad I discovered oat milk! We love making it with the vanilla and dates (or any sweetener). Soon I’ll be posting a chocolate oat milk recipe that we also can’t get enough of. Let me know if you try it!